Today’s cake would make a great Valentine’s Day cake….but if you love chocolate like I do, it’s perfect for any occasion or no occasion at all! I’m going to show you how to make a cake that looks like a GIANT piece of candy! For our tutorial today we’re working with white cake but we looking back, chocolate cake would have probably made more sense for a true chocolate lover, haha! Strawberry cake would look great too once sliced into, like a strawberry filled chocolate piece of candy. So many options! 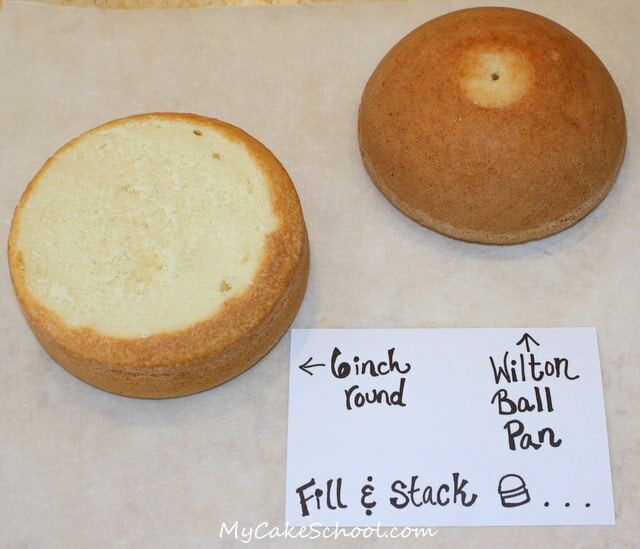 To start off, we’re working with one six inch round cake layer, and one half of a Wilton ball pan. This will give us a nice shape to work with, that quickly takes on the appearance of a piece of candy! Of course you can also experiment with square cakes if you’d rather! 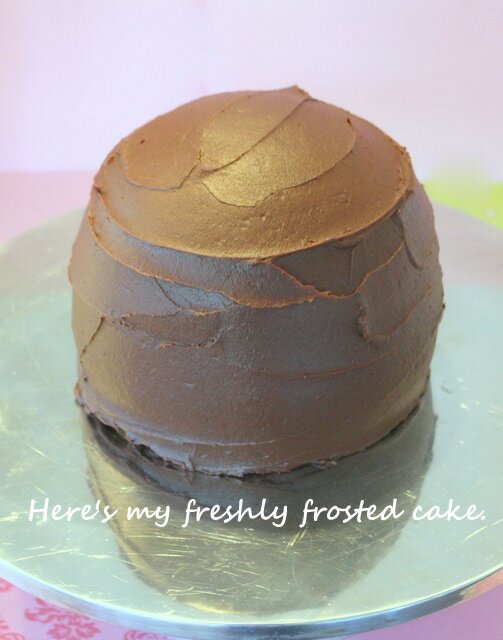 I decided to whip up a batch of ganache frosting….but any chocolate frosting will do. You just bring the cream to almost boiling and then pour your chocolate into it. Take it off the heat…stir gently until fully melted. Let it cool until it has reached “frosting consistency”. I use a 2:1 ratio of chocolate to cream when using semisweet or dark chocolate. 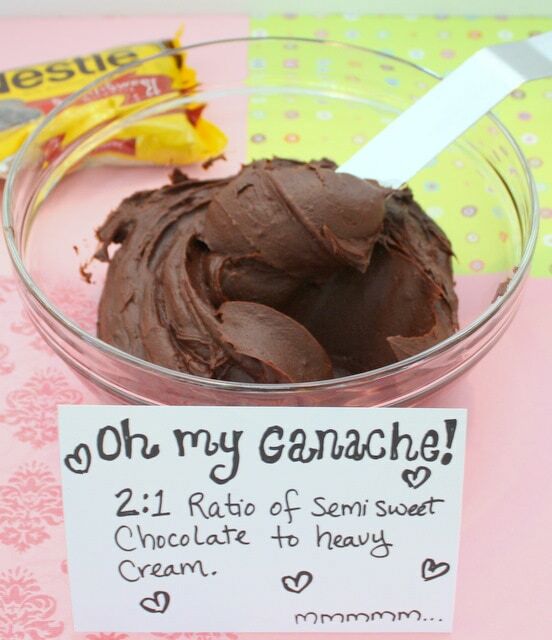 Here’s a Simple Spreadable Ganache Frosting Recipe if you’d like more details! I put my cake on it’s own cake cardboard, cut down to size…and then slid it onto my turntable. Now the real fun begins! 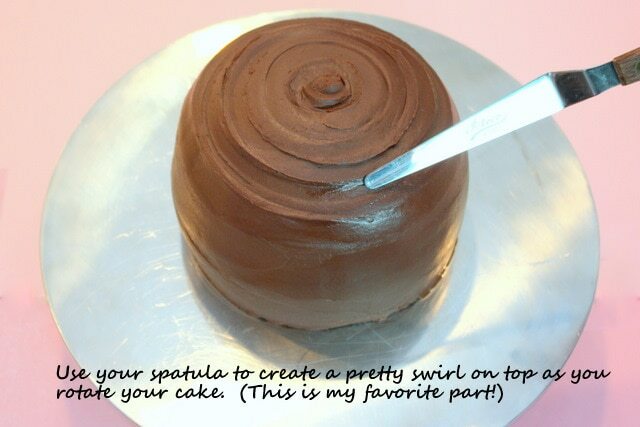 Using a small spatula, apply pressure to the center of the cake as you rotate the cake and gradually work your way down. I added my spiral just to the upper portion of the cake! So pretty! Now that the cake is finished, let’s create our foil wrapper. 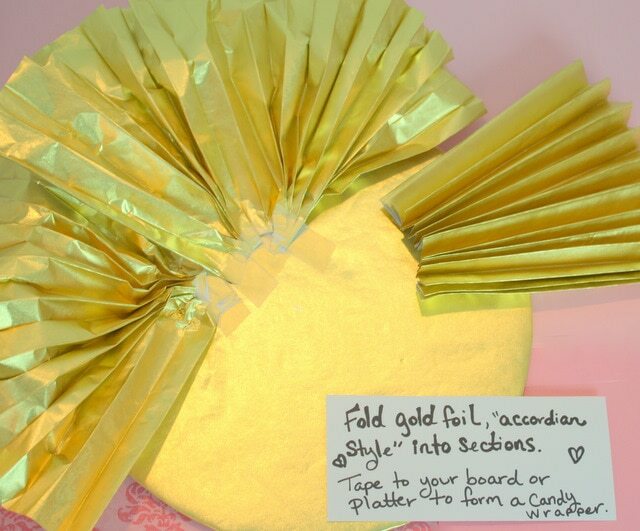 I used gold foil for this step and folded it “accordion style”, attaching with tape to the edge of our cake base which was also wrapped in gold foil. You can fluffy out and unfold your foil here and there to make it look like an unwrapped candy wrapper. 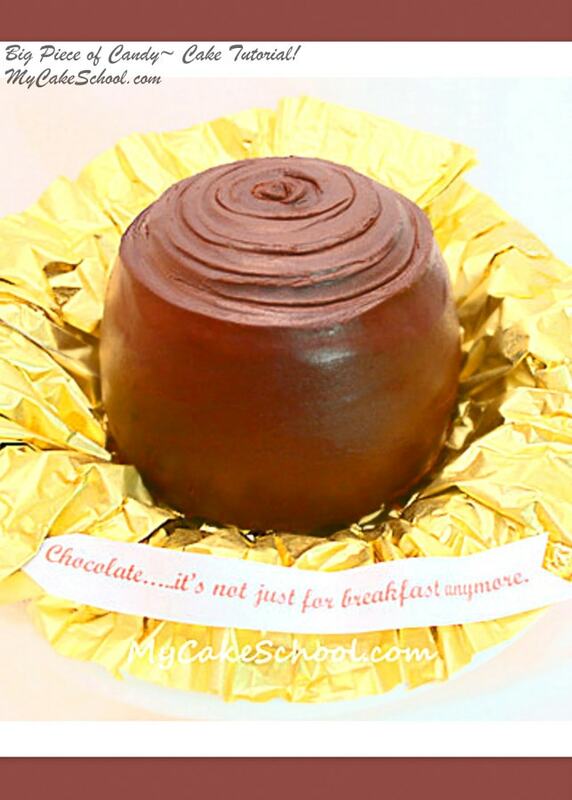 I placed our finished candy cake on the center of our wrapped cake base. Remember, the chocolate cake is on it’s own cake board cut down to size (the cake itself doesn’t come into contact with the tape). You may find it helpful to chill the cake until firm before moving to the cake board. 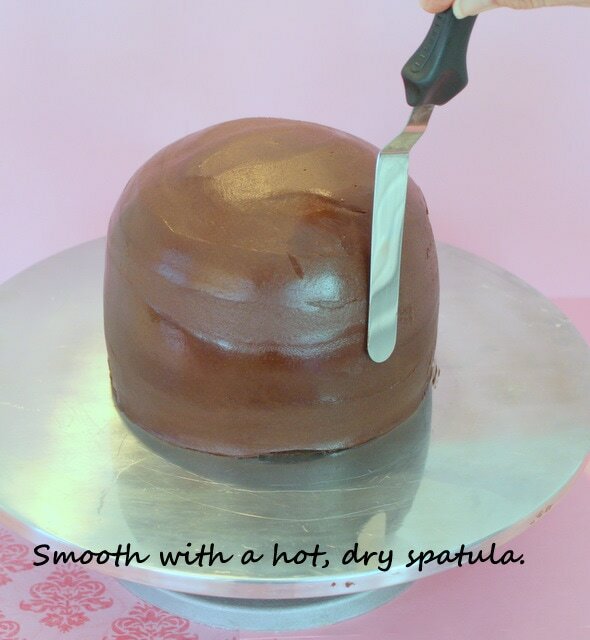 Apply a little ganache frosting to the cake base as a “glue” before placing the cake. Isn’t it beautiful!?! I just love the simplicity of this cake design in addition to the fact that it is really easy no matter what your level of cake decorating! I added a little message at the bottom of the candy wrapper as an optional step. Do you like the message? 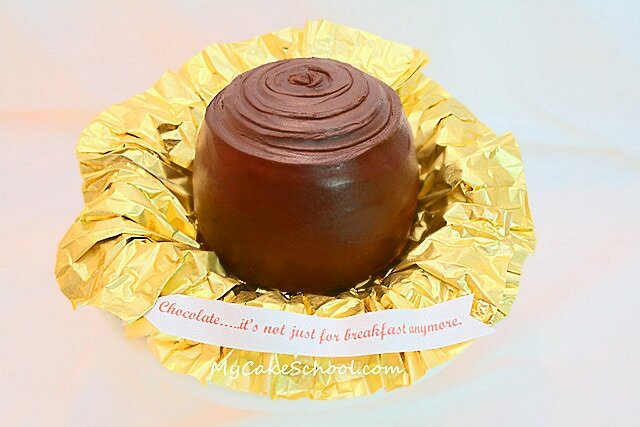 I had trouble deciding which “chocolate saying” I liked the best…..but since I have been known to eat chocolate for breakfast (yesterday), I thought that this one would be appropriate. I’m off to find a glass of milk! Hi cakenista, yes, if you are using 2 cups chocolate chips you will need 1 cup heavy cream. It is best to weigh your chocolate as well as the cream when making ganache. It also makes it easier when calculating the 2:1 or 3:1 ratio. A kitchen scale is great to have and will save time when baking. Hmmm… I think it may be difficult to make that work with the size difference. The ball pan is 6″. Are you making this “piece of chocolate” cake? -Do you have a larger bowl that you could bake in if you don’t have another larger pan? You could probably even bake a few 8″ layers, fill and stack, and then while partially frozen, carve away much of top layer around the edges to round things out.